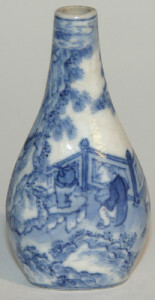 A tiny blue and white Chinese snuff bottle was a curious present for a ten year-old from an eccentric godfather. I fell in love with it, the satisfying shape, the little painted figures, the exotic. I like to think it led me to seek out the school pottery classes which were run by Gordon Baldwin. He was a great potter & teacher but we disagreed about almost everything. He made monochromatic sculptural pieces – I wanted to make colourful oriental-inspired ceramics; he taught me sound technique and I learned that pottery didn’t have to be functional. During an apprenticeship at Tingewick Pottery I learned how to make slip-cast forms and precise colours. I went on to study History of Art at Cambridge, which introduced me to broader influences. I remember being struck by the power of repeated imagery on a trip to Paris. Those rows of identical advertising posters at every Metro station. I began to understand Andy Warhol which led me to the Velvet Underground and 15 years working as a music publisher. But clay lured me back and I escaped to Italy where I learned to use a wheel and made maiolica earthenware. Every Tuscan kitchen was a Morandi painting. Back in England things had moved on, minimalism was back. Clutter was out, china cabinets – reinterpreted as wall installations – were in. Rupert Spira, Gwyn Hanssen Pigott, Edmund de Waal, Anthony Gormley, Piet Stockmans and so many others were exploring repetition. I rediscovered the sculptural in Hans Coper’s thrown forms and Jennifer Lee’s hand built work. Earthenware no longer seemed the right medium so I went back to Art College to learn about stoneware and porcelain. These artists all influence my work. I use any appropriate technique, throwing, slip-casting and pinching. My wall-pieces occupy a space in my mind between painting and music – they explore rhythm, repetition and colour. The component forms are both different and the same – but they all owe a debt to that little blue and white bottle.